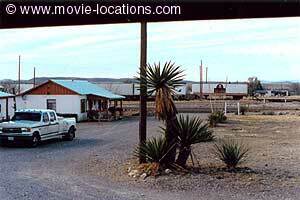 Paris, Texas, a real enough town, is the Godot of film locations. Lots of waiting, but it doesn’t actually turn up. At the opening of Wim Wenders’ magical, but somewhat soft-centred, road movie, the amnesiac Travis (Harry Dean Stanton) is found by his brother Walt (Dean Stockwell) in Marathon, a tiny town north of the spectacular Big Bend National Park in West Texas. The vast park, a great bite taken out of Mexico where the Rio Grande skirts the Chisos Mountains, is one of the USA's best kept secrets. You can see the park's dramatic scenery in Fred Schepisi’s 1982 Western Barbarosa, with Willie Nelson and Gary Busey, and as the interior of the fantastic island in Robert Rodriguez’s inventive Spy Kids 2: Island of Lost Dreams. The motel in which Travis and Walt stay is the Marathon Motel and RV Park, West Highway 90, Marathon, a stunningly picturesque jumble of log cabins on the desert highway, alongside the railway, with breathtaking views over the West Texas desert to the Chisos Mountains. It's been substantially renovated since the film was shot there in 1984. The cross-state journey takes Travis and Walt to Port Arthur and Houston. But not, sadly, Paris. The town itself, on Highway-82, 90 miles northeast of Dallas, is a cutesy little town, totally destroyed by fire in 1916 and rebuilt in the Twenties, since when it’s largely been unchanged. Paris celebrates its exotic European name with a 45-foot replica of the Eiffel Tower – adorned with a red stetson.